Sara received her undergraduate degree from Wheaton College (MA) and a Master's from USM's Muskie School of Public Service in 2010. She joined DRM as an intake coordinator in September 2002 and was later named Public Policy Director. Sara continues to provide information and referral services, while also coordinating the agency’s policy work, maintaining DRM’s print/online media presence, and overseeing data management for reporting and quality assurance purposes. 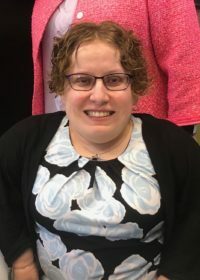 Sara is past Chair of the MaineCare Advisory Committee and served a term on the mPower Loan Board, which oversees Maine's adaptive equipment loan program. In 2014, she co-presented two workshops at the National Disability Rights Network’s Annual Conference, both on topics related to the intake process. Additionally, Sara regularly collaborates with the Secretary of State’s Office to provide training at its annual conference for Municipal Clerks and Registrars.